“Our state is rich in bio-diversity. In fact diversity is a key quality of Karnataka in every respect. It gives me great pleasure to know that MM Activ has now entered into media sector with NuFFooDS Spectrum Magazine. I think this initiative is very important because there is a big communication gap between the people and the field of science and technology,” said Minister of State for Food and Civil Supplies and Consumer Affairs Dinesh Gundu Rao while launching the magazine and unveiling the Nutra India Summit 2014, as the Chief Guest. 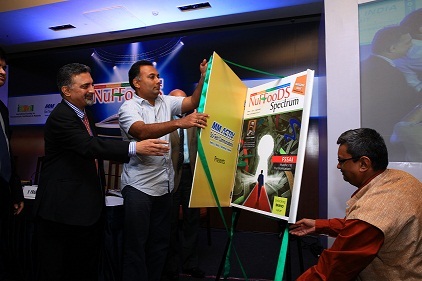 Minister Dinesh Gundu Rao unveiled the magazine in the presence of the magazine editor, Mr. Milind Kokje (in right), Jagadish Patankar, Publisher of the magazine NuFFooDS Spectrum, Dr V Prakash, Chairman Advisory Board and other dignitaries. In this sector the media can play a role as catalyst and facilitator and be friend of the industry, academia and Government. I am confident that the Publisher would use the media power for positive synergy with the industry to fill in the communication gap in many more areas in science and technology for the benefit of society. The industry has been assured of government support.” he opined. To bridge the communication mismatch between the nutraceutical industry and science and technology space, MM Activ Sci-Tech Communications Pvt. Ltd. (MM Activ), engaged in creating, planning, development and implementation of the fully integrated national and international trade shows, focussing on frontier technologies, took upon itself this task and is glad that the minister with the food portfolio under his wings graced the launch of NuFFooDS Spectrum, a magazine dedicated to food, nutraceutical, nutritionals, naturals and allied industry amidst an august gathering of industry captains and policy makers at The Lalit Ashok today. Chairman of NuFFooDS Spectrum Advisory Board Dr V Prakash said, “In the Nutraceutical industry there is a void in the media world regarding the path of new industry growth, innovation in R&D for new product development, harmonisation of the regulatory framework, investments in world class infrastructure; factors that place India in the driver’s seat. Nutraceuticals, nutritionals and naturals and large spectrum of the export market may see itself into higher internal consumption with the huge buying capacity in India”. ”The ‘impact’ agents that drive sector growth with India as a leader, with a huge amount of information of traditional; medicine on the one side and 6,000 years of traditional knowledge on the other side, can be leveraged. This integrated media platform shall drive the infomatics. I feel, this makes it imperative for everyone who matters in the food, nutraceutical, nutritionals, naturals and pharma sector to have this magazine on their table as soon as it is out on a regular basis. This is a global opportunity that NuFFooDS Spectrum has for a global vision for tomorrow and a national vision for today with a clear pathway of Leadership India,” Dr Prakash added. Over 120 people from the industry, academia, research institutes, and trade commissions were present in the evening held at The Lalit Ashok.